I hate malodors. I think it's natural for moms to be sensitive to bad smells, especially when it comes to clothes don't you think? Smelly clothes spell disaster and I feel other people might think I'm not taking care of my family when their clothes are smelly. This is precisely how Downy became my partner in combating malodors. 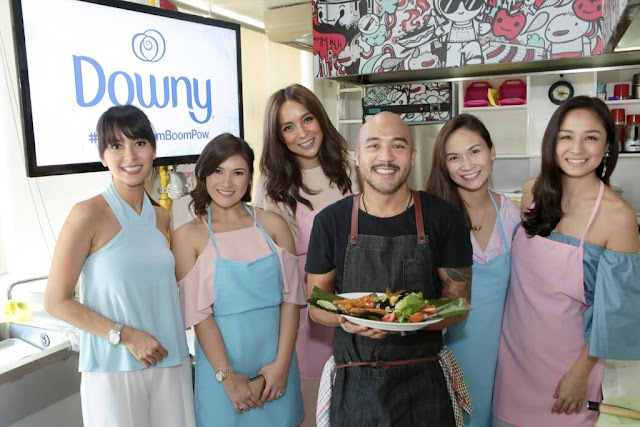 Last week, Downy held a "malodor challenge" among mommy celebrities and media by holding a cooking demonstration event with Chef JP Anglo as it introduces its best formulation in fabric softener which helps fight against 10 tough smells on clothes for longer lasting freshness. 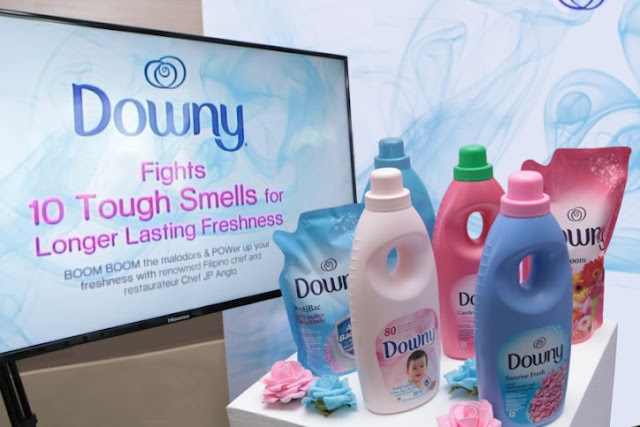 Dubbed #DownyBoomBoomPow, the campaign invites people to identify the tough malodors they face in their daily routines and prove that the newest Downy innovation is the solution to these dilemmas. Before the event, we were given an apron to wear during the cooking demonstration, which was supposedly pre-washed with the latest Downy fabric softener. Chef JP exclusively prepared several everyday Pinoy dishes which emit strong odors, such as Grilled Vietnamese Pork Belly and Sizzling Sinigang Fried Chicken with Batwan Gravy, plus the special dish of Grilled Bangus with Talangka and Burong wrapped in Banana Leaves intended to really put Downy to the malodor challenge. After enjoying these delicious dishes, we were asked to inspect our aprons for any tough smells which might have stuck to it such as food smell, sweat, and smoke. To our surprise, the aprons were as fresh and clean as ever - effectively demonstrating the effective malodor removal and freshening benefit of Downy's best ever formula! Here's a video of the event prepared by my fellow Grasyas, Iris Acosta of Pinayads.com. Boom boom everyday malodors and power up with freshness with the best ever formula from Downy - now available in supermarkets nationwide. More information can be found on facebook/downyphilippines or follow the conversation online with the #DownyBoomBoomPow hashtag.